How do we learn to see? Proper visual experience during the first weeks and months of life is critical for the proper development of the visual system. But how does experience modify neural circuits so that they exhibit the proper responses to visual stimuli? Knowledge of the mechanisms by which the brain is constructed early in development should inspire new therapies for repairing the brain if it develops improperly or is damaged by disease or injury. At the present time, it is not possible to directly view all or even most connections within a living neural circuit. Therefore, neuroscientists often build computational models to study how these circuits may be constructed and how they may change with experience. A good model allows scientists to understand how these circuits may work in principle, and offers testable predictions that can be examined in the living animal to either support or refute the model. Undergraduate Ian Christie ’16 was interested in understanding how neural circuits in the ferret visual system become selective to visual motion. At the time of eye opening, neurons in ferret visual cortex respond to an object moving in either of two opposite directions. With about a week of visual experience, each neuron develops a preference for only one of these directions, and greatly reduces its responses to the opposite direction. Previous models of this process posited that the primary source of the change was in the organization and pattern of inputs to the cortex. But, recent experiments from the Van Hooser lab (Roy/Osik/Ritter et al., 2016) showed that stimulating the cortex by itself was sufficient to cause the development of motion selectivity, which suggests that some changes within the cortex itself must be underlying the increase in selectivity, at least in part. Further, other experiments in the lab of former Brandeis postdoc Arianna Maffei (Griffen et al., 2012) have shown that the cortex becomes less excitable to focal stimulation over the first weeks after eye opening. Ian constructed families of computational models that could account for both of these observations. 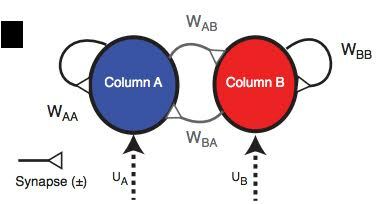 In the model, columns of neurons in the cortex already receive input that is slightly selective for motion in one of two opposite directions, but the connections between these cortical columns are so strong that both columns respond to both directions. However, the activity that is caused by simulated visual experience activates synaptic plasticity mechanisms in the model, that served to greatly reduce the strength of these connections between the columns, allowing motion selectivity to emerge in the cortical columns. The project was supervised by faculty members Paul Miller and Stephen Van Hooser, and the results were published in Journal of Neurophysiology (Christie et al., 2017). Future experiments will now look for evidence of weaker connectivity between cortical neurons with visual experience. This work was supported by the “Undergraduate and Graduate Training in Computational Neuroscience” grant to Brandeis University from NIH, and by the National Eye Institute grant EY022122. It also used the Brandeis University High Performance Computing Cluster. 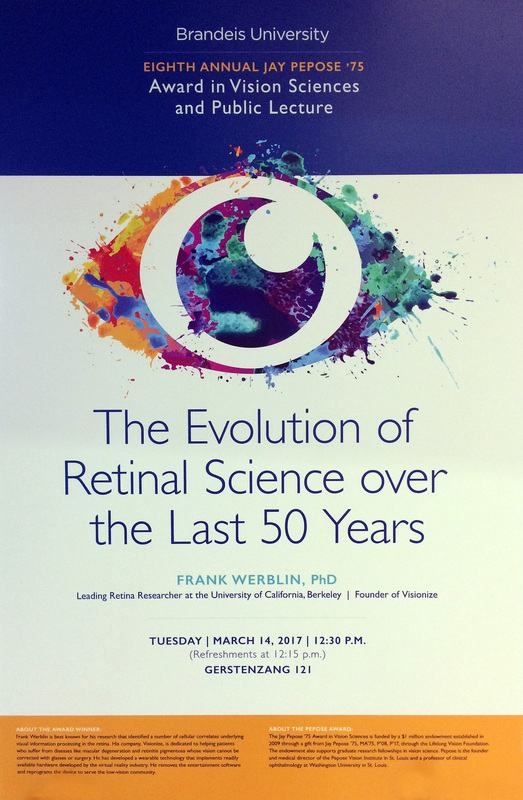 During his research, Professor Werblin identified a number of cellular correlates underlying visual information processing in the retina. He has authored many articles in peer-reviewed journals, and has contributed articles on retinal circuitry to the Handbook of Brain Microcircuits (Oxford University Press) and retinal processing in the Encyclopedia of the Eye (Elsevier). Werblin founded Visionize in 2013, a company dedicated to helping patients suffering from vision diseases that cannot be corrected with glasses or surgery. The Pepose Award is funded by a $1 million endowment established in 2009 through a gift from Jay Pepose ’75, MA’75, P’08, P’17, and Susan K. Feigenbaum ’74, P’08, P’17, his wife. Pepose is the founder and medical director of the Pepose Vision Institute in St. Louis and a professor of clinical ophthalmology at Washington University. He founded and serves as board president of the Lifelong Vision Foundation, whose mission is to preserve lifelong vision for people in the St. Louis community, nationally and internationally through research, community programs and education programs. While a student at Brandeis, he worked closely with John Lisman, the Zalman Abraham Kekst Chair in Neuroscience and professor of biology at Brandeis. David Williams from the University of Rochester has been selected to receive the 7th annual Jay Pepose ’75 Award in Vision Sciences. Williams will be presented with the Pepose award on Tuesday, April 12th at 12:30 pm in Gerstenzang 121. 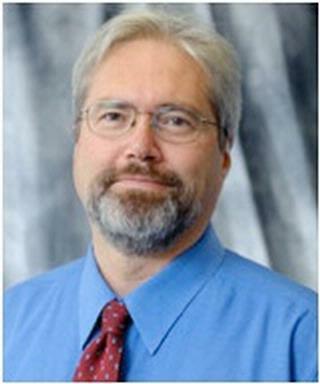 The celebration will include David Williams talk titled, “Seeing Through the Retina”. Williams’ research has improved the effectiveness of laser refractive surgery, the design of contact lenses, and enabled the imaging of single cells in the retina. William T. Newsome, a Stanford neuroscientist, will receive the 6th annual Jay Pepose ’75 Award in Vision Science on March 18. Newsome will deliver a lecture, “A New Look at Gating: Selective Integration of Sensory Signals through Network Dynamics,” on March 18 at 4:00 PM. The lecture will be held in Gerstenzang 121 and is open to the public. 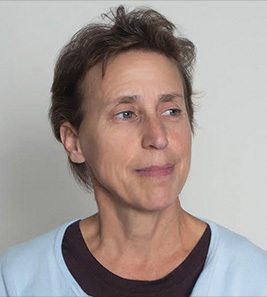 Professor Newsome’s research at Stanford has helped scientists better understand the connection between visual perception and visually guided behavior. 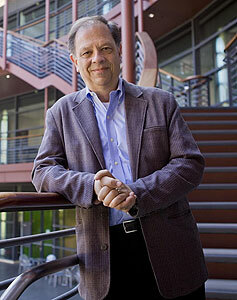 Newsome is the Harman Family Provostial Professor at the Stanford School of Medicine and is the Vincent V.C. Woo Director of the Stanford Neuroscience Institute. The Pepose Award is funded by a $1 million endowment through a gift from Brandeis alumni Jay Pepose ’75, MA’75, P’08, P’17, and his wife, Susan K. Feigenbaum ’74, P’08, P’17, through the Lifelong Vision Foundation. The endowment also supports graduate research fellowships in vision science. We sometimes take it for granted how the way we see enables us to perceive and interact with the world, but how our visual system works is amazing. It’s an intricately choreographed process – from the light that comes into our eyes, to the way that our brains carry that information and form it into an image we can understand. If brain cells are improperly connected during growth and development, or if part of the system is destroyed by injury, all kinds of visual havoc can be a result. But how does a brain get wired properly in the first place? In a paper in the Journal of Neuroscience last week, Professor Steve Van Hooser’s lab reported some of the effects of experience on development. The new paper shows evidence that neurons in all layers of the visual cortex aren’t just ‘born’ with the right connections between the parts of the brain that control vision. According to their data, the act of seeing itself makes changes in how the neurons process visual information. The lab is continuing their studies of brain circuits to uncover how, during development, the act of seeing changes how you see. Clemens JM, Ritter NJ, Roy A, Miller JM, and Van Hooser SD. The Laminar Development of Direction Selectivity in Ferret Visual Cortex. J. Neurosci. 12 December 2012, 32(50): 18177-18185.